If you’ve ever driven along a highway with billboards, you most likely have seen the infamous messaging, “Text _____ to 123-3333 to learn more”. Opting in for a product/service or more information through text is convenient, quick, and oftentimes less frustrating for a customer than going through the tedious processes online. For most people, texts are read quicker on delivery than emails– and this is the obvious answer for a business owner looking to drive more leads. Unfortunately, Infusionsoft doesn’t have SMS capabilities natively. If you’re looking for the best tool to integrate this straight into your system, check out PlusThis. 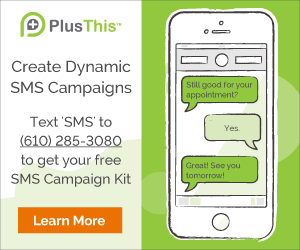 PlusThis integrates directly with Twilio, the leading platform for SMS messaging. Once you set up a free account and register a number with Twilio, you’ll configure it with PlusThis to create text to begin your first text to opt-in campaign. Sound awesome? What’s even better is the process is simple and fast. You’ll be driving more leads with the click of a button. Choose the Twilio number you’d like to use for the sequence. Choose the field you’d like to store the customer’s phone number to. Choose a keyword to start the sequence. This can be anything– examples include “demo”, “webinar”, “deal”, etc. Draft your first message that is automatically sent when the customer texts the above keyword to the above number. Choose the field you’d like to save their response to. Add more messages, choose tags you’d like to apply, or branch the sequence in different directions based on their response. That’s it. From there, you can sit back while leads are driven straight into Infusionsoft for you. Instant deliverability for the customer = more conversions for you. They’ll get a simple advertisement such as this, opt in, and PlusThis will run all of the background work. Curious to see it in action? Text “demo” to (610) 285-3080 for a quick example of how conditional SMS works. I’m sure the most pressing question is what do I need to do to accomplish this. Again, it’s simple. You pay the wholesale price through Twilio, which is as low as $0.0075 cents per message. Once you get set up with PlusThis, you’ll integrate your Twilio account and will have access to our SMS Sequence and SMS Message tools (along with all of our other features). Read more about PlusThis here. Good luck implementing SMS into your business! Would this enable us to send a text message to only certain Tags? Hi Cindy! Absolutely you can send text messages to people with certain tags. You can either route them into specific sequences using a decision diamond in a campaign, or you can just search the people with the tags and then put them into the campaign you want.